The coin falls from above, into chute, and slides down to the turntable below. (top on, see part descriptions at bottom). The star ratchet under the chute is operated by the coin slide which is located above this unit. The star ratchet, now removed, rotates the small gear, causing the coin turntable to rotate clockwise. The third coin is about to drop into coin feed tube while the pawl is approaching the next detent position. The third coin has dropped into the payout feed tube and the new coin is now under magnet. If it is a nickel, it will fall through a hole into the coin box. If it is magnetic, it will be held in position. The pawl falls into next detent position, the coin is held by the magnet, and a new coin has fallen into place. It will be examined the next time the player pushes the coin slide above. The non-magnetic coin will fall at this point, into the coin drawer. The coin skimmer on the left, will push any extra coins in the feed tube to the right, generally also into the coin drawer. accept a coin passed on and approved of by the coin slide. The coin can be a token or a nickel. check to see if the coin is a token or a real nickel. if it is a nickel, it is real money and should be placed in the coin box for later collection. prevent the coins from overflowing the feed tube by skimming the coins at the top into the coin box. By paying out tokens, the management can more easily account for winnings. Real money will walk out in the players' pockets. A player putting in slugs will get paid out in slugs as they are generally magnetic. If the game is located where gambling is prohibited, the management can claim no money is exchanging hands and will only exchange real money for tokens for patrons they recognize. The star ratchet is just under the chute. The chute catches the coin as it falls from the coin slide above. It has a gear that engages the small gear that causes the turntable to rotate. The coin slide has a tab that engages the star ratchet as the player depresses the coin slide. The turntable is circular and has a hole for each coin. It has notches in the rim to prevent rotation in the wrong direction. The magnet is red and U shaped. There is a flat metal plate located under the magnet and turntable. It can be seen poking out from under the magnet on the right side. In the current position, it covers the hole and coins, magnetic or not, continue around the turntable and are dropped into the coin feed tube. If the plate is located to the right, it uncovers the hole under the magnet that leads to the coin box. Any non-magnetic coins are dropped and are not rotated around to the feed tube. 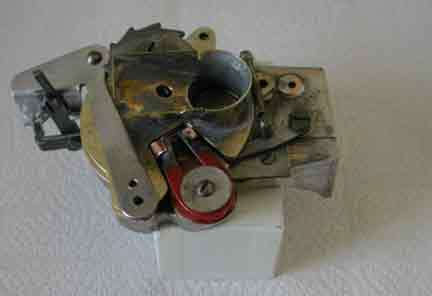 The pawl is the spring loaded lever that fits into a notch in the turn table. It prevents the turn table from rotating backwards (counter-clockwise) when the coin slide is pulled back out. 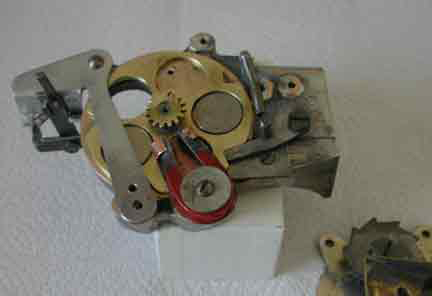 The coin skimmer is the lever on the left side of the assembly. It also is pushed by the coin slide as it is operated by the player. It pushes any coins at the very top of the coin feed tube into the coin box, preventing the coins from filling up the tube and jamming the rejector. See also the coin slide animation and a picture of the coin slide and rejecter together.